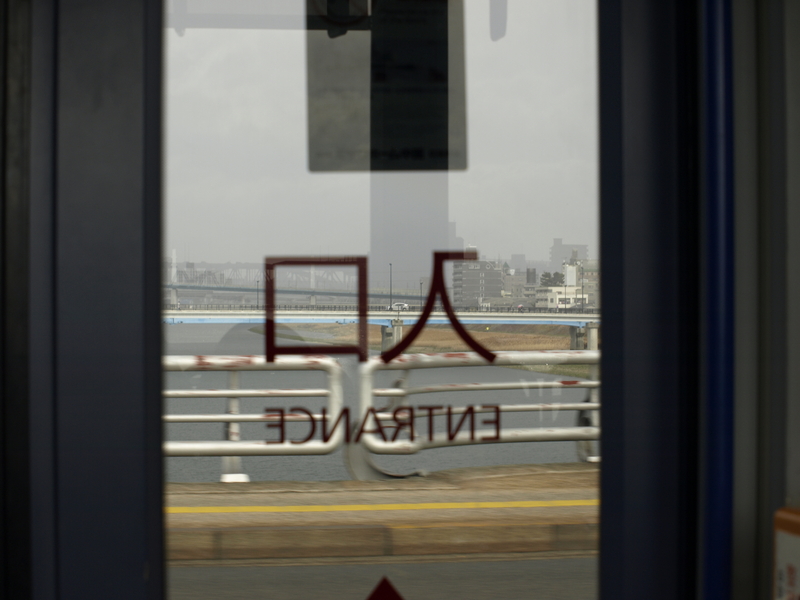 Soon I will be publishing a post about a trip to Kobe I took with my girlfriend Sayaka. This post, however, is focused on the food we ate in Kobe, as in the space of one day we managed to eat a lot. Read about the rest of the trip here. We started as soon as we arrived, at the Peruvian Festival. We joined the queue, unsure which language to speak, or what we were really ordering. We picked up two plates, sat down and dug in. The first dish was a large chicken breast, fried and lightly salted. Simple, but very delicious. On the side was rice mixed with coriander and what I think was sweet corn and a small serving of onion salsa. 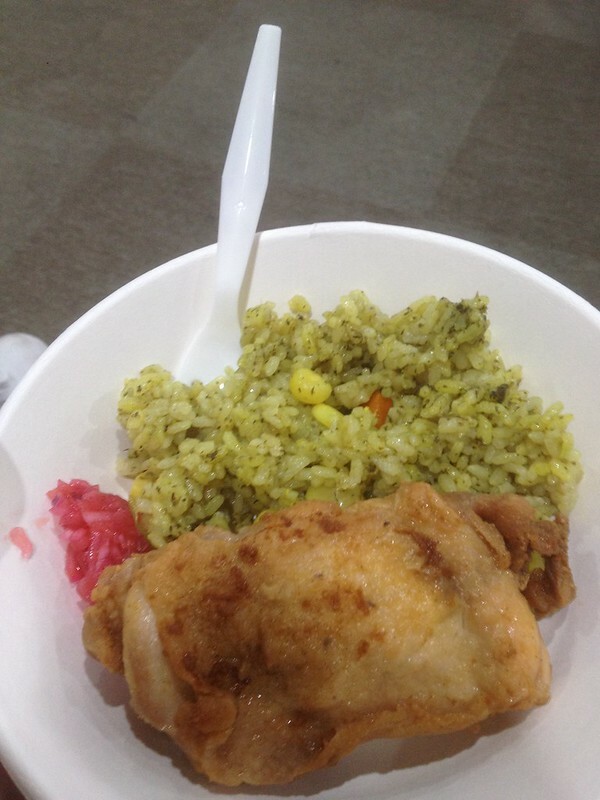 The salsa and rice gave a bit more flavour to the dish, in contrast to the chicken. The second dish that we had (we were sharing, like I’m not going to try some of every food she orders…), was a very odd looking thing. A beef curry with carrots, and sides of refried beans, plain white rice and again, salsa. This dish was the opposite of the first, with the beef being incredibly flavoursome while the sides were more basic, with simpler flavours. However, once again they came together nicely. We washed that down with some Cristal, imported Peruvian beer, with a strong taste to it, as we sat and watched the dancing. I wasn’t sure if these dishes came from a restaurant, or were home made by members of the community in Kobe. I didn’t see any business cards nearby. However, the food was great, if not a little expensive. I didn’t expect Peruvian food to be like that at all, as I thought it would be closer to Spanish or Mexican food (despite the refried beans and the rice). Some hours later, and a few more drinks in, we sauntered, by mistake to the Minami Matsuri. A mixture of tipsiness, lots of walking, and amazing smells coming from the stalls made us hungry again. 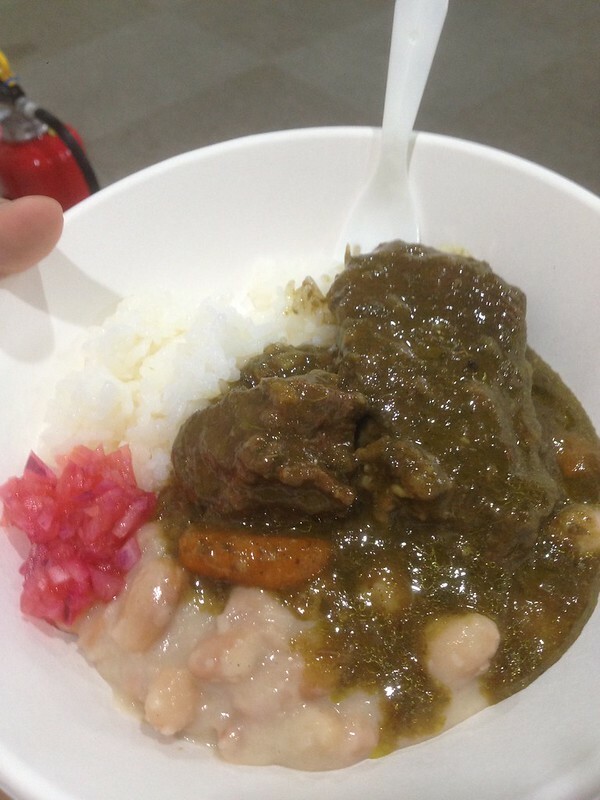 We found a small Thai stall, serving food that they have on the menu at their restaurant in downtown Kobe. 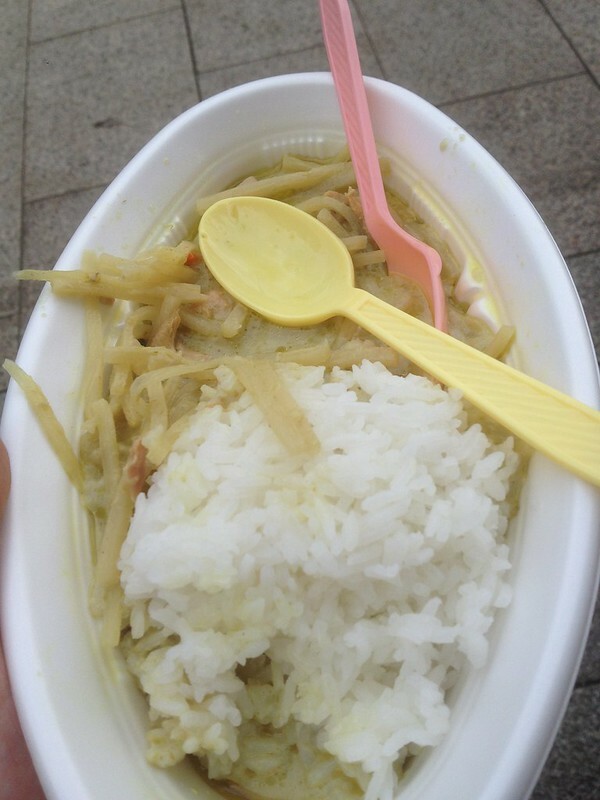 We picked up a plate of Thai green curry with chicken and bamboo, and a side of rice. Now, it was a fairly hot day in Kobe, despite being overcast and at times a little rainy. So eating an incredibly hot Thai curry didn’t help. It wasn’t long before we were both sweating, gulpin down water and furiously fanning ourselves. The spice aside, the curry was actually very nice, with the softness of the chicken contrasting the crunch of the bamboo, both soaked in a creamy sauce, and rice on the side to help a little with the heat. We took our time eating it, sitting by the grass as we watched families and couples stroll past, the distant sound of samba music drifting in the air. By evening, we had found our way to Kobe’s Chinatown, bustling as the evening set in, with people coming in and out of restaurants as touts barraged us with noise from every corner, every street and every shop doorway. Unfortunately, the nationally famous pork bun shop (Nikuman in Japanese, Cha Siu Bao in Chinese) had already shut for the day, undoubtedly having sold out. Well we were in Chinatown, so why not get Chinese food? 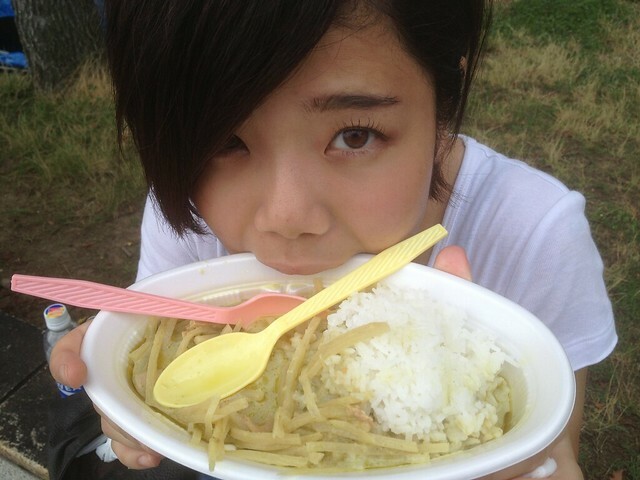 Sayaka chose a restaurant, seemingly at random. We were quickly seated in the fairly quiet place, and the purple clad waitresses took our orders. 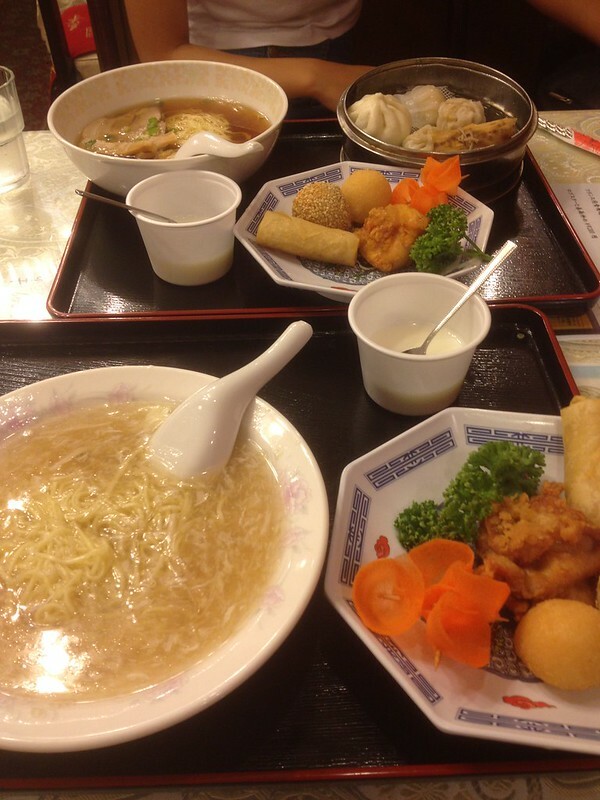 We decided to both get a set menu, as it was easier and good value for money, coming with a bowl of noodles, and a 10-piece roll and dumpling set and a piece of fried chicken. I can’t recall all of the 10-piece set, but all the regulars were there: spring roll, pork bun, pork dumpling and so on. 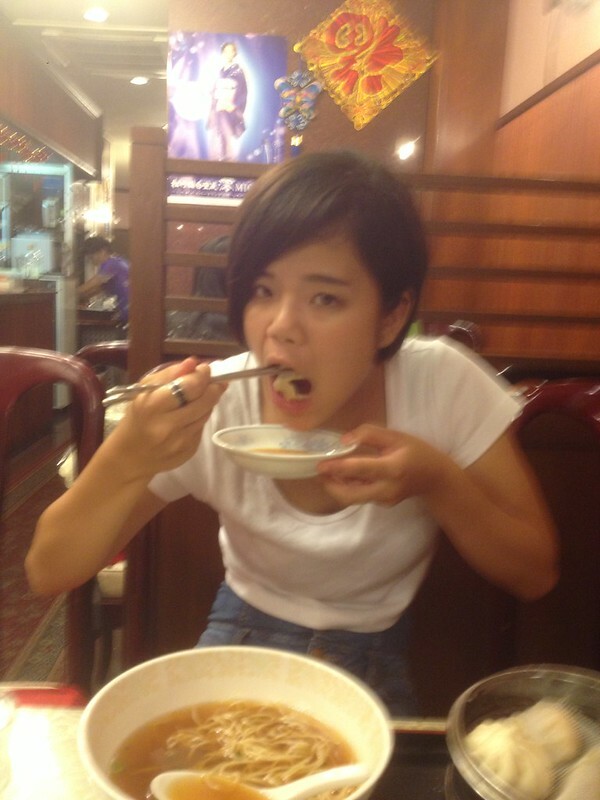 Sayaka had a simple pork noodle soup, while I had shark-fin soup (I know, it’s unethical to eat it). The dumplings and rolls were actually better than the main dish. Shark fin soup has no depth of flavour, and the only flavour that is there, from the shark fin, is very rich. After a few mouthfuls it starts getting boring, and a few mouthfuls more it becomes difficult. Sayaka’s pork noodle soup tasted much better, though again fairly simplistic in the flavours, a simple watery pork stock, a few slices of pork and some onion. All in all we had a lot of good food and good drink in Kobe. It’s a very multicultural city (compared to most in Japan), and the food shows it. It also beat my record for number of different nationalities food I’ve eaten in one day! That’s right, my adventure in Japan is over, and it’s been a very long time since I wrote anything on this blog. I want to keep writing, and I will be looking back more and more to write posts about my adventures in Japan, and some since returning. So some quick news. Yes, I returned from Japan on 15th August, with nearly 30 hours travelling door-to-door. But before leaving Japan, I of course did many things, went to some new places and some old, met new people and made friendships stronger. I got a girlfriend. I went to Spain. I visited the new tallest building in Japan. I ate food from all over the world: Spain, Italy, France, England, America, China, Korea, Japan, Peru, Thailand. 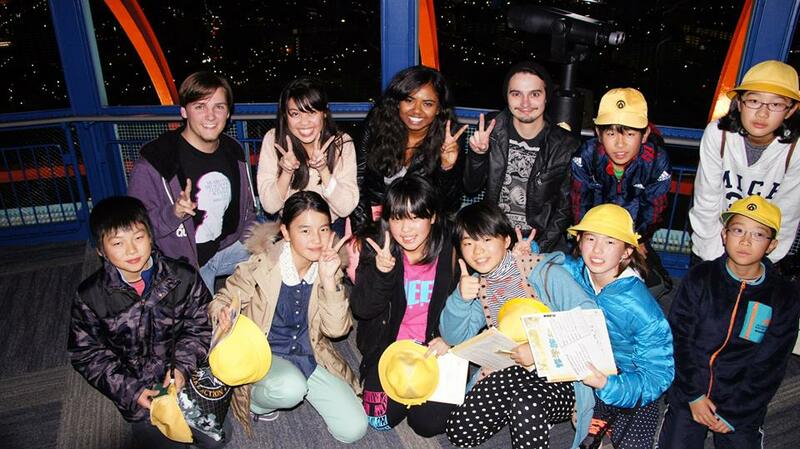 The last few months that I had in Japan I will remember forever, as they were some of the best to me. Soon I will be returning to university, but the adventure is not over. I want to keep travelling, keep experiencing new things. I plan to go to Finland within the next year, possibly other European countries. My girlfriend is coming to England in September, too, which will be another sort of adventure entirely. So yes, hopefully I will start to post more here, along with the literal thousands of photos I have (see here). I think the next post will be about my trip to Kobe, although there are dozens of other things to write about too! I have started a new project here on wordpress that I think many of you will be interested in joining. I want to start a community, and a directory, for travel writers. A place where you can submit your own writing, read others. You can share your own experiences and share in others, and get more recognition and publicity. A few weeks ago, I wrote about the time that we went to Eikanji in Kyoto to view the Autumn leaves. Well the day didn’t end their. After leaving Eikando, just as it started to get dark, we met a couple of other friends, and headed into the city centre. Completely different from the temples that almost surround all of Kyoto, the city centre is full of people, noise and lights. Large parts of the city are shonnenkai, which are like normal streets with shops and resataurants, but covered with a roof. Sort of half way inside and half way out. 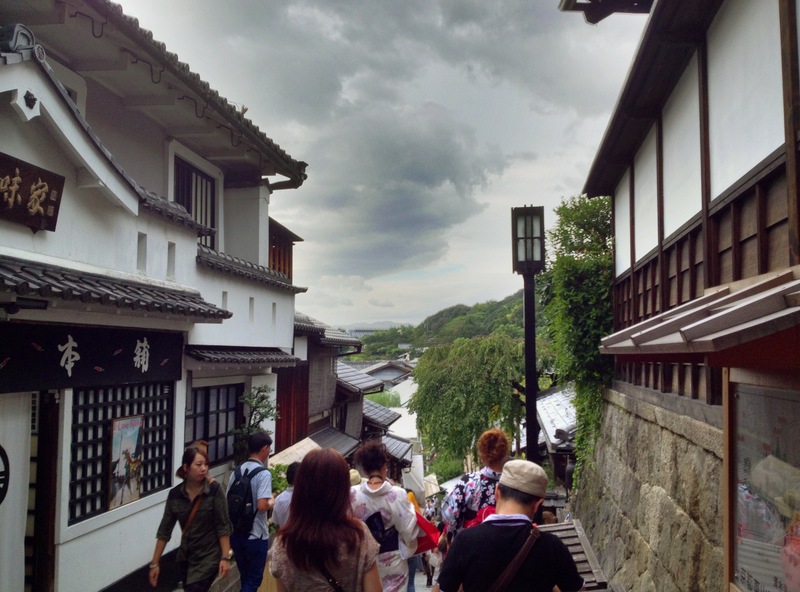 This time, we went to a part of Kyoto that I had never been to. We were going to the Kyoto Tower, near Kyoto Station. Standing over 100 meters tall, it pierces the Kyoto skyline, taller than any other building in the city. It’s distinctive shape and bright orange and white colouring make it stand out, an is visible from many other vantage points around the city. 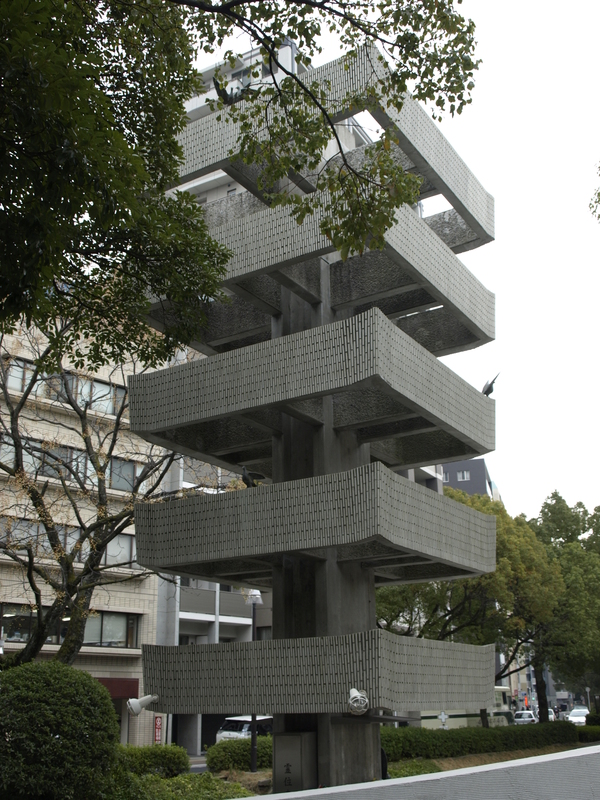 The tower was completed in 1964 to coincide with the Tokyo Olympics. There is no real purpose for the building except as a tourist attraction. As Kyoto has strict rules on construction, it stands out of the skyline clearly, towering over everything around it. This has cause much controversy, with many people believing it to be too modern for Kyoto, once being called “a stake in the heart of the city”. So up we went to the observation deck. It was a clear night, incredibly clear, a sea of lights around us, ringed by mountains. An orange moon rose above the Kiyomizudera temple. Atop the tower, at all angles are free-to-use telescopes. It was such a clear night, that the feint white glow of the illuminated Osaka Castle, some 25 miles away, could be seen. As long time readers of this blog might be starting to realise, I love views from high places, be it the countryside or the city, night or day. 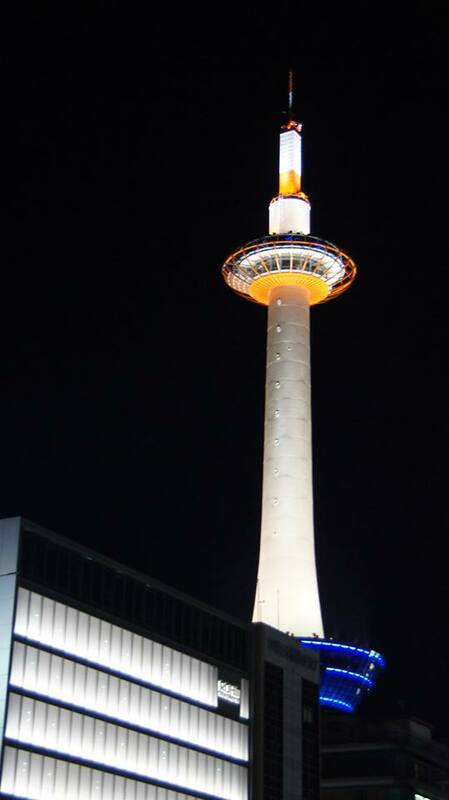 Of course Kyoto Tower was no different. These kind of places are very serene, and I could stare out of the views for hours. Which I often have. But unfortunately, the peace could not last. As has happened several times to me here in Japan. We were attacked. Attacked by a noisy, moving hoard. Surrounding us, shouting and lights flashing at us. They came out of no where. See, I have a theory about this. School groups will go to some famous tourist site, such as the Kyoto Tower (similar events have happened to me at Kinkakuji and Nara). But it seems these groups are never there to see the sight itself. I believe they are taken to these places with the instructions to find a foreigner, and talk to them in English. We did feel sort of like celebrities, with photos being taken and people asking for autographs. 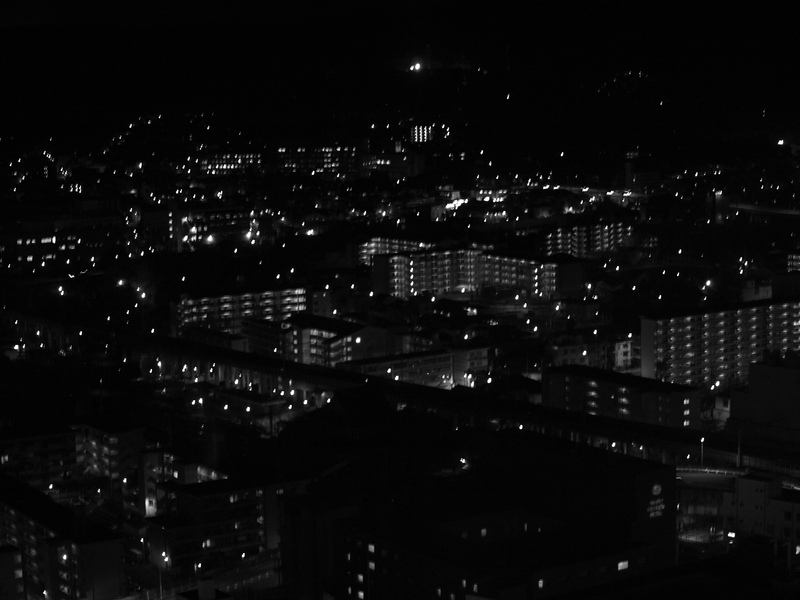 To see more of my photos from atop the Kyoto Tower, look here. You can also follow me on twitter or like me on facebook. OoOoOoOoOoOohhh. No, not that kind of curse. A much milder one, but still incredibly annoying. My family’s curse only applies to tourist attractions. For years now, it has been a frequent theme on my family’s travels to go to see some site, and to arrive there, only to find it is closed, or under renovation, or some other reason why we can’t see this place. The earliest memory I have of this was in Holland. We were in Holland during the foot and mouth epidemic in the UK. As such, after travelling to a park, we were refused entry, in case we brought foot and mouth with us. A temple in Ueno Park in Tokyo. It looked great, brightly coloured. I was taking photos of course. As I got closer, I realised it was covered in a giant tent, painted to look like the temple, as it was being restored. Several of the halls at Kiyomizudera were covered in huge tents and scaffolds, every time I have been there. In Kobe, I wanted to visit the earthquake museum. I walked miles on a rainy Thursday, only to find out that it is closed on Thursdays. One of the large temple halls in Nara, is tented and under reconstruction from 2010 until 2018! I hope, somehow, this curse will be broken, and we can actually see the things that we travel and hope to see. 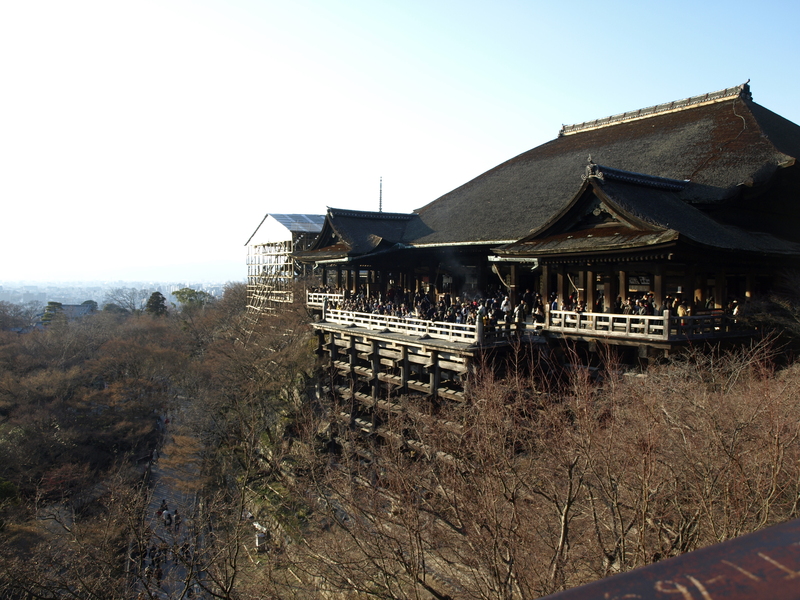 I’ve been to Kiyomizudera several times now, at least three that I can think of. It is, simply, one of my favourite places in Kyoto. The fresh mountain air, the wind in the trees, and a view of the bustling city below, making you feel sort of removed from the rest of the world. It would be a very good place to simply sit, and think, to clear your mind. If it wasn’t for the tourists. Like so many other beautiful places in Japan, it is constantly rammed with tourists from all over the world, destroying any calming notions you had about the temple, and instead you become infuriated as you shuffle through the crowd of loud, ignorant, boisterous tourists. Thank God for headphones. But enough about the tourists. Back to the happy place. 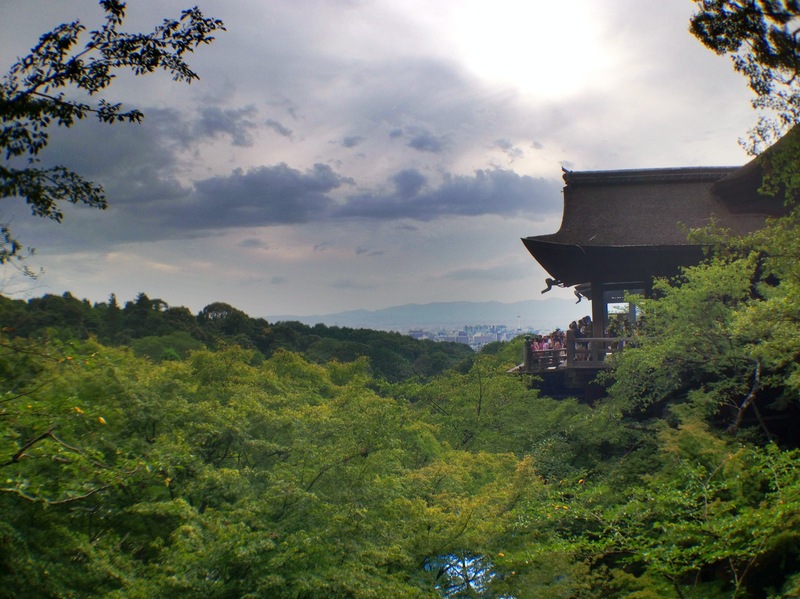 Kiyomizudera, meaning Pure Water Temple is nestled in the trees of Otowa Mountain, of the eastern mountains (Higashiyama), propped on huge wooden stilts sits the main temple building. The temple was founded in 798AD, and it’s current buildings were constructed in 1633. 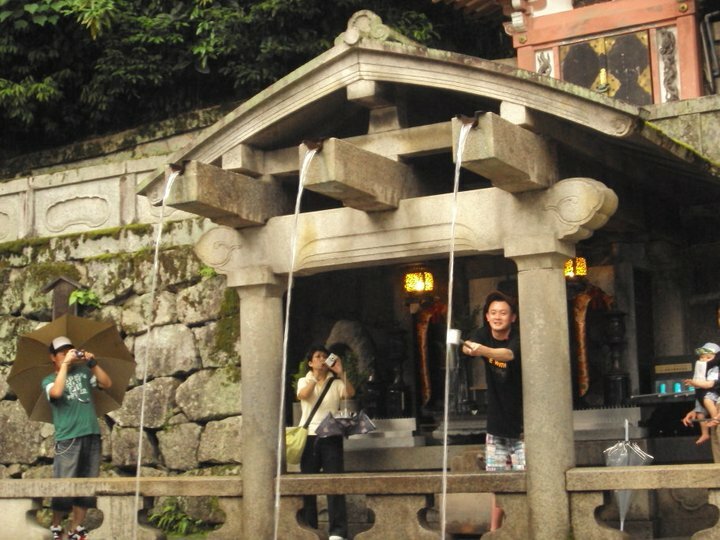 Its name comes from a waterfall above the temple, which waters trickle through the grounds. Like many of the other historic places in Japan, Kiyomizudera is also a UNESCO World Heritage Site (bringing my total to around 25). The temple grounds feature a few main sites, as well as many smaller ones, and several shrines withing as well. Matsubara-dori, the road leading up to the temple is always packed with people. It is lined with traditional souvenir shops and some restaurants. The niōmon gate, present at every Buddhist temple in Japan. Inside, the temple gate is guarded by two demons. Behind, a three-storied pagoda can be seen. 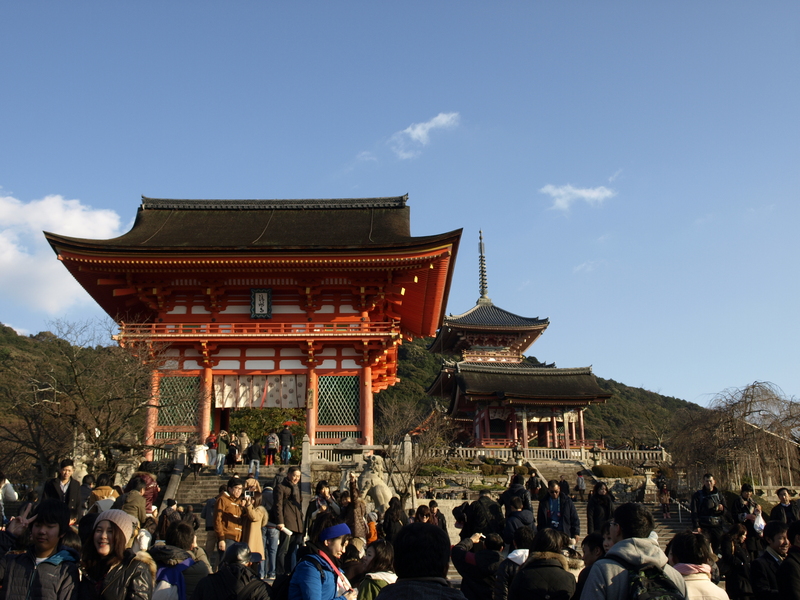 The Main Hall (Hondo) and stage of Kiyomizudera. It is built upon huge, 12-meter high keyaki (Japanese Zelkova) pillars. The drop is 13 meters, and the saying “to jump of the stage at Kiyomizu”, similar to the English “take the plunge” comes from here. Those that survive the drop are said to have one wish granted. During the Edo Period (1603-1868), two hundred and thirty four jumps were recorded, with 85% of people surviving. Of course this is now banned. The Otowa Waterfall. After making a prayer, it is believed that if you drink water from one of the three streams, you will be granted longetivy, love or knowledge. Though it seems that no one knows which is which. Despite my griping at the tourists, Kiyomizudera is definitely a lovely place to visit, especially I imagine in the Autumn when the leaves change. For only ￥300, the view is spectacular, and the buildings are beautiful. There are some other buildings in the complex, but I have not seen them because, as is the curse of my family, they were under rennovation. Definitely check it out if you can. You can see more photos of Kiyomizudera here, here and here. Aah yakiniku. I’ve spoken about it briefly before in my Food Recap a few months ago. But seeing as I went again on Thursday, I though I would write a bit more about it. I went with some friends, Yuusuke, a Japanese student at KGU, and Oleg & Roman, two Australian-born Russians, here visiting friends. 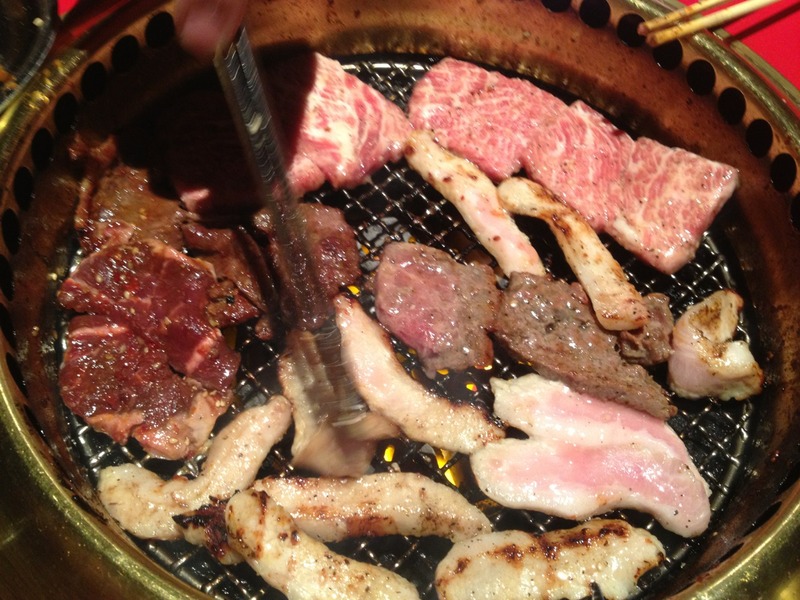 Yakiniku literally means “grilled meat”. There are yakiniku restaurants all over the Japan, but it’s a little bit different to what you’d get from a mixed grill back in the UK. Now, my local yakiniku is called Chifaja (which doesn’t mean anything). Entering the restaurant can be an assault on the senses. It’s loud with large groups of friends or colleagues eating, drinking and talking. The smell of cooking meat and smoke fills the air. It’s incredibly warm inside, and there are plumes of smoke coming from each table. Occasionally you will see a flash of bright yellow flames and the sound of sizzling. So why all the smoke and fire? The best way to explain yakiniku is DIY barbecue. They bring you uncooked meat, seasoned and chopped, or vegetables, or whatever you want to cook. Then, in the centre of each table is a small, circular grill with an open gas flame. But there is more to it than just that. This yakiniku has two things in particular: tabehoudai and nomihoudai. These words mean “eat as much you like” and “drink as much as you like” respectively. For a little under ￥3000 (£17), you can eat and drink as much as you want for 90 minutes. And good God we gave a good go of it. Plates and plates piled with different meats: beautifully marbeled chunks of beef, chicken marinated in herbs and garlic, pork dipped in egg. And then bowls of salads and soups. And of course beer. But yes, the food was the focus. We had so much meat that we couldn’t cook it fast enough! Our grill went up in flames twice from dripping fat catching alight, causing a very brave waitress to rush over, removing the old grill using a tool with one hand, while transferring our meat onto the new grill with the other. We. Ate. A. Lot. Oh, and did I mention there was ice cream as well? However, there is a catch to this. Anything that you don’t eat, you have to pay extra for. By the end of the meal, it becomes a serious team effort to finish off the last couple of pieces of meat, almost grimacing at the amount you have already eaten. I waddled all the way home. So, after leaving the Peace Park, on a dreary day drizzling with rain, I headed back to the hostel for a long needed shower. I checked in, and found out that there were very few people in the hostel at the time, with it being late January, a very off-peak time. Having had my shower, I headed into the lounge, grabbed a beer from the vending machine indoors, and sat down to see who was around. It was pretty quiet, just an American, some Argentinians, and of course a couple of Australians as well. With nothing going on at the hostel, I decided to go visit my old friend Bom, at his bar in downtown Hiroshima: Koba. I had been to Koba 2 years before with some other people I had met in Hiroshima, and had had Bom and his staff as friends on facebook ever since. The place was exactly as I remember, friendly staff and customers. I grabbed a seat at the bar, started chatting to some other customers, ordered a beer and shook off the night cold. The next day started off quite groggy, but with it being my last day in Hiroshima, I was determined to go out as soon as I could. Thankfully, it had stopped raining by now, and the sun was out. 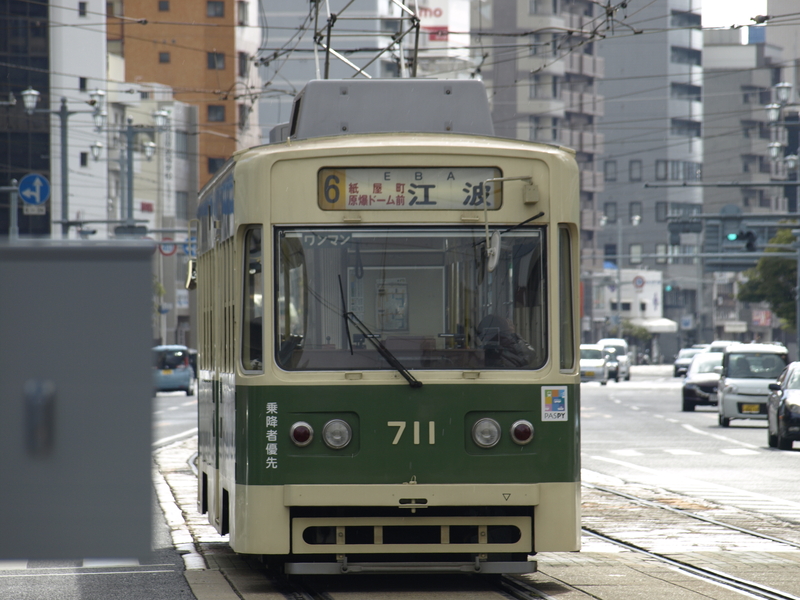 I packed my camera, and jumped on one of the Hiroshima trams, headed for Miyajima. Hiroshima does not have a subway system like most Japanese cities do. Instead, it has a wide system of trams, running alongside the normal roads. It’s cheap, and as it’s above ground, you get to see the city as you travel. 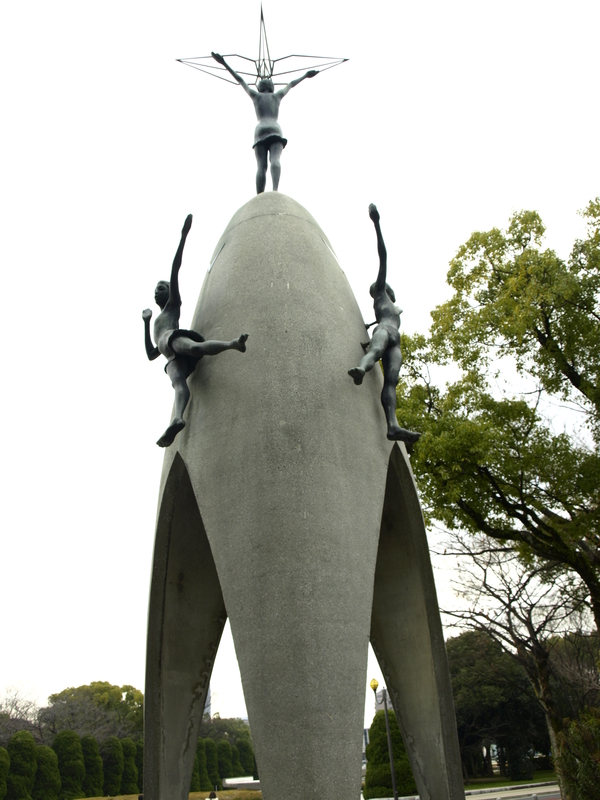 I remember the first time I went to Hiroshima, I was very annoyed, because the tram to my hostel passed the Atomic Bomb Dome. I didn’t want to see it in passing and by accident, but when I could see it properly. It takes quite a while to get to Miyajima Station by tram, about an hour or so. The trams don’t move very fast and have to stop for traffic in the cities. However, a large portion of the route follows the coast, with some very beautiful views of the Seto Inland Sea. The ride is peaceful and relaxing, trundling down streets and through neighbourhoods on a sunny Sunday afternoon. It was quiet, as it always is on trains in Japan, and it wasn’t crowded, a welcome relief from the crammed trains I am used to around Osaka. And, as always when on local lines, I was stared down for the whole journey by an elderly Japanese woman. Being an island, there is no land link. 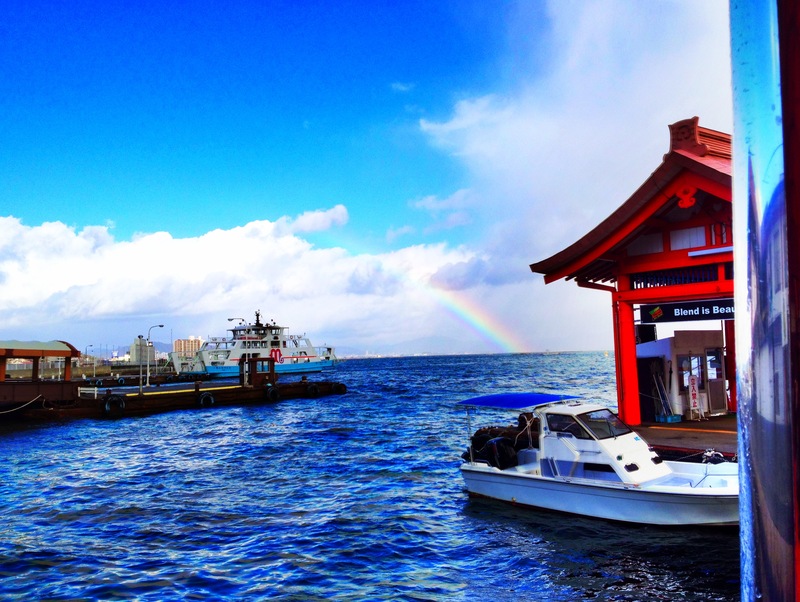 Once you get off at Miyajima Station, you have to take a ferry to get to the island. There are two companies working here, JR West and Matsudai Miyajima. A return ticket to the island is very cheap, and the ride across doesn’t take very long at all. The area is famous for oysters, and as you pass over the waves, you can see many small oyster farms dotted in the sea. 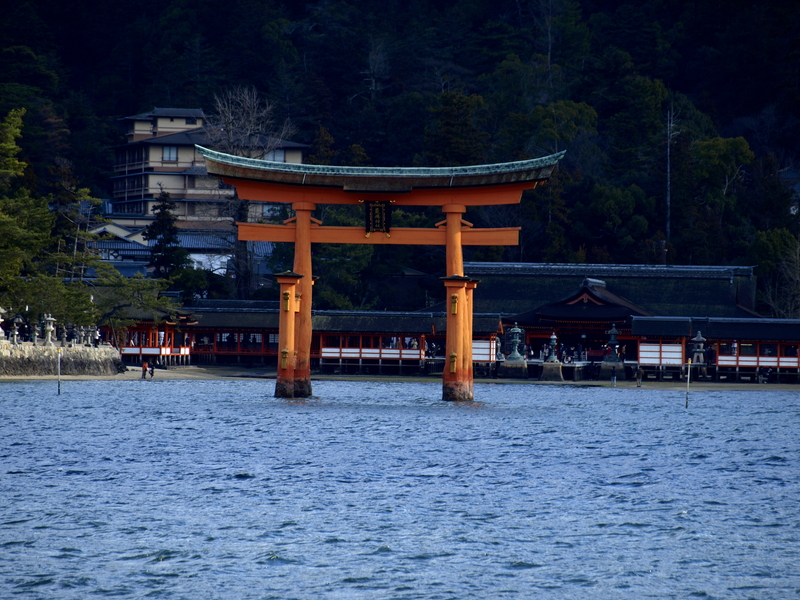 Coming closer to the island, you get your first glimpse of the famous torii, the red gates famous in shrines in Japan. Though it is now commonly called Miyajima, after the small town on the island, the island is actually called Itsukushima. The shrine on the island was founded in the 6th Century, and it’s current layout is around 900 years old. The gate and the shrine itself are both in the sea. The island is considered sacred, so in the past commoners weren’t allowed to step foot on the island itself, thus the shrine built on stilts. It still has such religious significance that since 1878 no deaths or births are allowed on the island, with pregnant women close to giving birth, elderly and terminally-ill people all being sent to the mainland. Deer. There are deer all over the island. In Shinto, they are considered messengers to the gods, and are thus sacred. 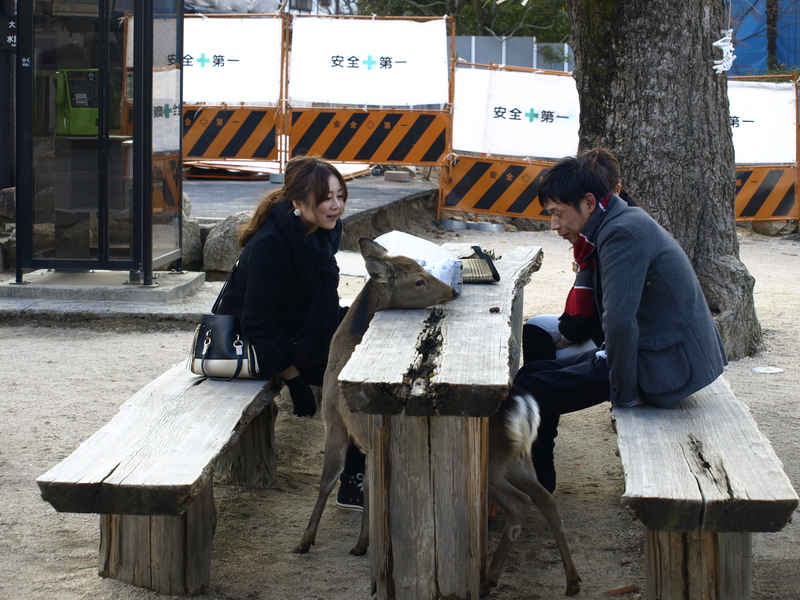 The deer have become so used to tourists and people in general, they freely roam the streets, follow people around and generally pester you for food. They have no problem with having their photographs taken or with being stroked by visitors, and I have never seen one run away. After strolling along the beach, and popping into some of the souvenir shops, I eventually got to the shrine itself. It’s a big, red structure, made of wood and set on stilts, stretching into the sea (or the beach at low-tide). Thankfully, it was fairly quiet when I was there, and I could take a slower pace to walk along the wooden walkways. The first time I went to Itsukushima, I stumbled upon a traditional Japanese wedding. Unfortunately, I was not as lucky this time, but I still think it is a beautiful shrine. One of the most famous sites in Japan, a UNESCO World Heritage Site and one of the three top sites in Japan, officially. 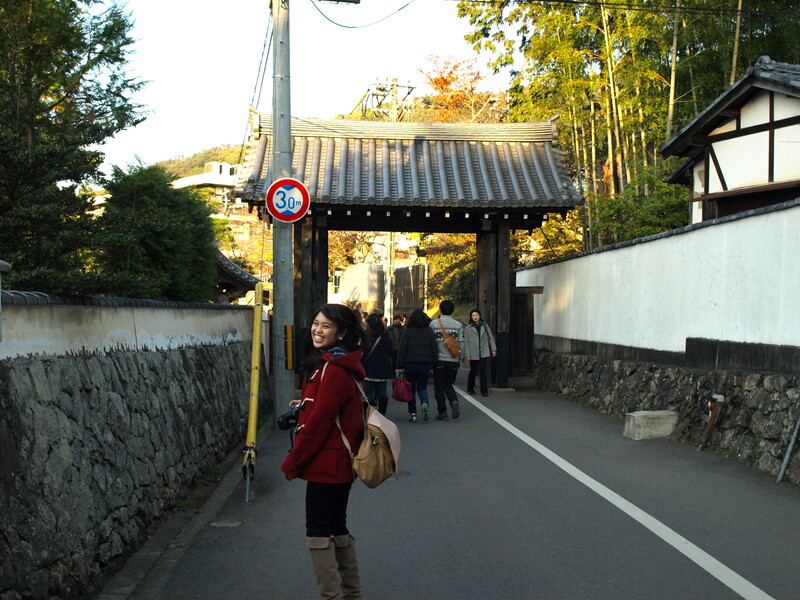 After seeing the main shrine, and the connected Buddhist temple, I decided to head up the mountain. The first time I had come to Itsukushima, I had walked up the mountain. But that was Summer, and I had much more time. 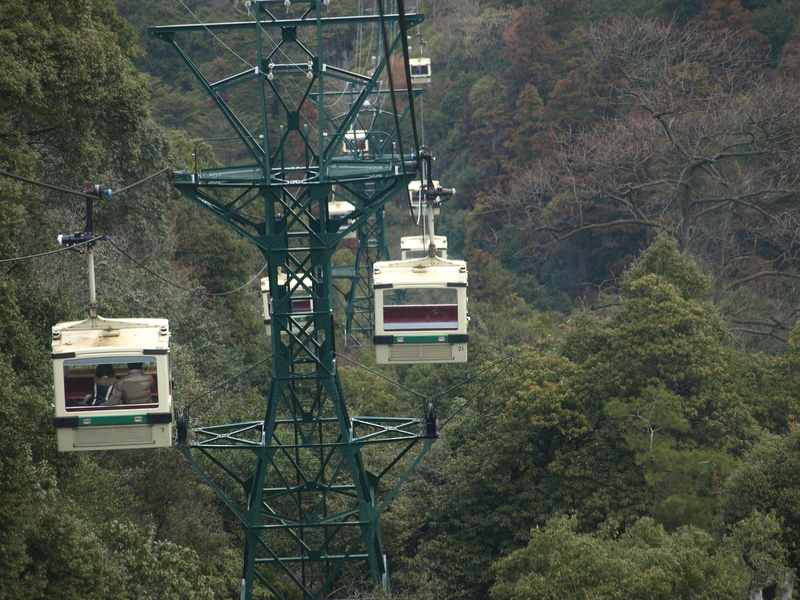 This time, I decided to take the “ropeway” to the top, a two part journey via cable cars to the top of the mountain. I was slightly dubious about it, hearing that it was fairly expensive and not worthwhile. They were wrong. The view from the cable car was amazing, looking over the mountains, forests and the Seto Inland Sea. I had always been told that there are monkeys at the top of the mountain, and indeed there are signs about the monkeys there. Yet everytime that I have been there, I haven’t seen a single monkey! However, I wasn’t there for the monkeys. I was there for the view. The view from the top of that mountain, on that island, in the middle of the Seto Inland Sea, is one of the best views I have ever seen, the setting sun reflecting off the sea, fishing boats as tiny specks in the water, and slowly the lights of dozens of tiny fishing villages appear up and the down the coast. Neither my photos nor my words can explain that view. I would have liked to have spent more time atop the mountain, but the last cableway down was fast approaching, and I didn’t to get stuck at the top and have to walk down in the dark. From what I remember, the path isn’t particularly a safe one. Upon heading back to the main town, I took a gentle stroll around the streets before heading back to the ferry terminal, my adventures in Hiroshima at an end. Almost. I woke up on Monday morning at 11am. My coach was at 10:40am. Oops. With no other choice, and having to get back to Hirakata before I had work in the evening, I went and bought myself a ticket for the bullet train. The bullet trains are impressive looking things, close to duck-faced. Though it is an experience to ride them, I don’t enjoy the journey itself. As Japan is so mountainous, they carved the tracks under the mountains. The constant change in pressure, and constant ear-popping is not something I enjoy. You can view all the photos from my trip to Hiroshima on my flickr page. About a month ago, back when I was still teaching regularly, I was sat at home thinking to myself “It’s been a month now that we’ve been on winter break, and I haven’t done anything. I haven’t even left Kansai since being here.” So, I rather impulsively decided to take a trip to Hiroshima. I booked my tickets and accommodation just two days before I left. After finishing work on the Friday, I left Hirakata and headed to Umeda to catch a night bus with Willer Express for the 6 and a half hour drive to Hiroshima. I made a mistake. In an attempt to help myself sleep, I downed a couple of beers before boarding. Once on board, I realised that not only was only I not tired, but now I needed to pee. And there was no toilet on board. Thank God that we stopped at service stations every hour or two. Anyway, the coach arrived at around 6.30AM on Saturday morning. It was still dark outside, and was a pretty cold day. I had about 9 hours to burn until I could check into the hostel, so I started to walk, unsure of what or where I was really going. With no where to go, I decided to sleep off a few hours in an internet cafe, and wake up when I could check in. Internet cafes are fairly cheap ways to find a place to stay for a few hours or even a night. You pay your fee, and you have your own booth, with a reclining chair that flattens verticle, a computer and a locker. There are vending machines, thousands of magazines and comics, and even showers! 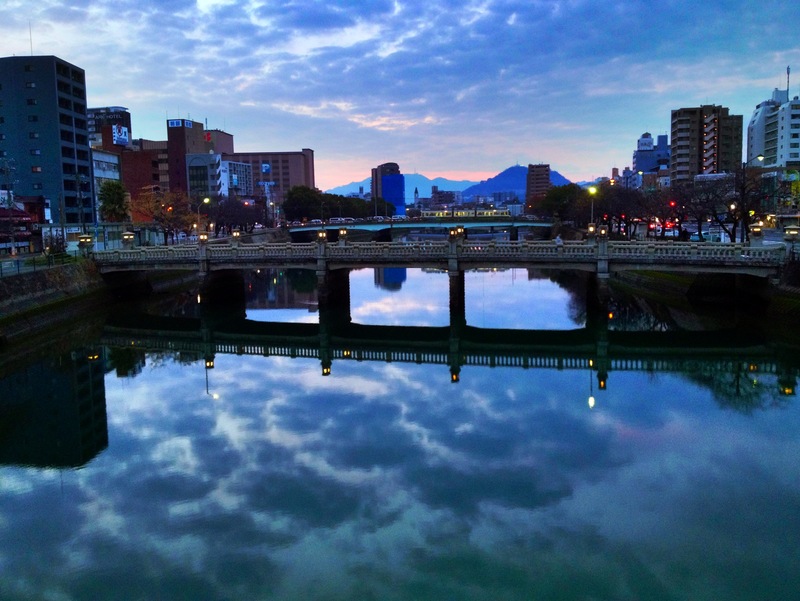 After napping in my dark, quiet booth for a few hours, I woke up and headed out into Hiroshima, feeling a little more refreshed than I had on arrival. 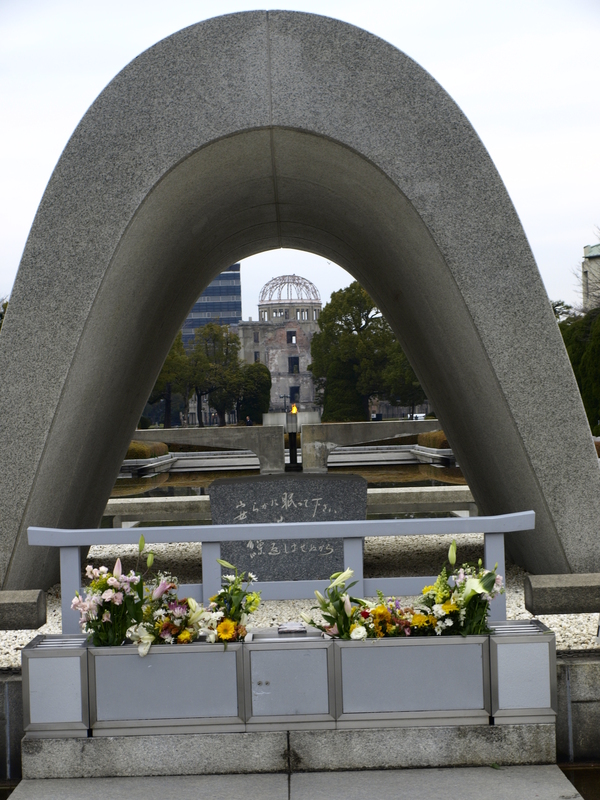 I still had a couple of hours until I could check in, so I made my way to the Atomic Bomb Dome and Hiroshima Peace Park. 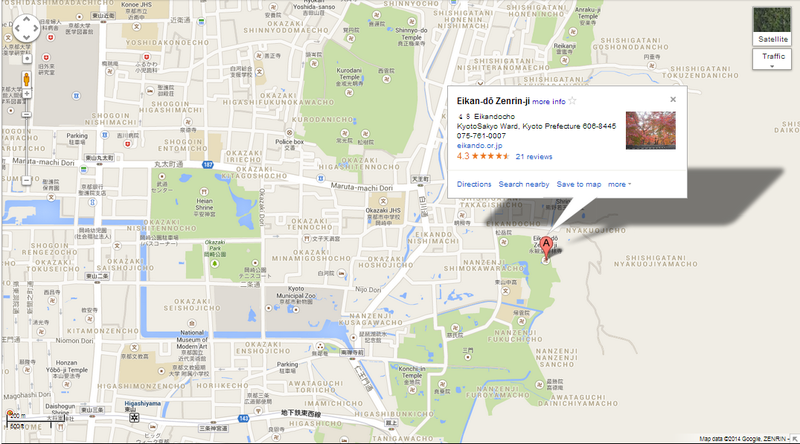 Now, this is my second time in Hiroshima, so I new what to expect at the park. It is a both beautiful and haunting place. 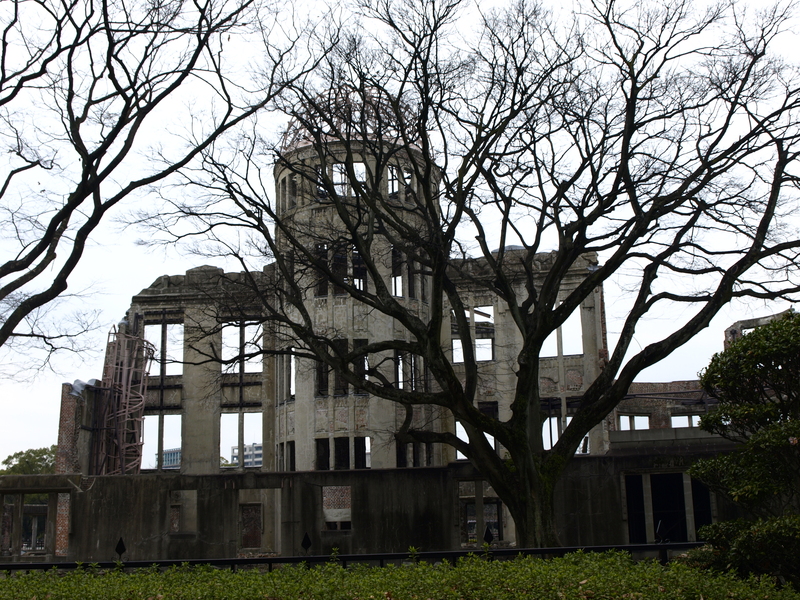 The Atomic Bomb Dome (Gembaku Domu in Japanese) is on of the few surviving buildings left from the bombing in 1945, most being destroyed in the original bomb, and many more destroyed in the following years to make way for the rebuilding of the city. The building itself was built in 1915, and was the Hiroshima Prefectural Promotion Hall. Now it is a UNESCO World Heritage Site and a haunting reminder of the war. All over the park you can see millions and millions of origami paper cranes. This stemmed from one girl, Sadako Sasaki. She was two years old when the bomb dropped. By the time she was twelve, she had been diagnosed with leukemia, caused by atomic radiation and given only a year to live. She learnt of a Japanese story that tells that anyone that folds 1,000 cranes is granted a wish. She began folding cranes, and went beyond until her death in October 1955. 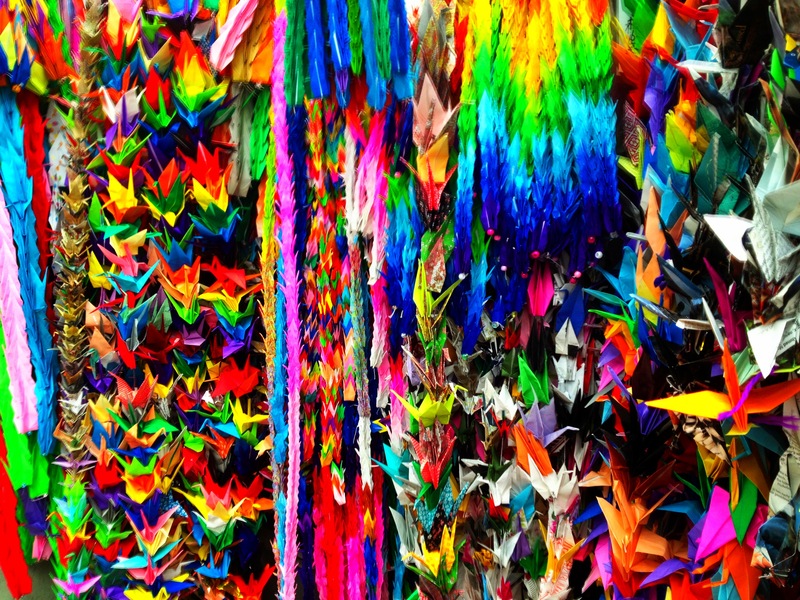 Since then, people all over the world have donated paper cranes memorial to her and other victims of the bomb. There is also the Memorial Cenotaph and Peace Flame. The Peace Flame has been kept alight since 1964, and will remain lit until all nuclear weapons have been destroyed. Though I had seen the museum before, I decided to go in again. It stands in two, box-like buildings, connected by a long enclosed walkway, separating two distinct parts of the museum. It reminds me of an old 70s school or university. To enter the museum costs a tiny ￥50, so there is no reason not to go in, except perhaps if you have a sensitive stomach. The exhibits inside are hard to explain, and I decided not to take photographs inside. The first half of the museum is focused on the history, the lead up to the bombing and Hiroshima’s role in the war. It also includes copies of the hundreds of letters sent by the mayors of Hiroshima to various people in politics, lobbying for a ban on nuclear weapons. The second half of the museum is the hard hitting part. Away from the history and politics, it tells the story of those ordinary people affected by the bomb. It features artefacts found after the bombing, such as the blood stained school uniforms of young children. Each piece also has the story of the owner of the items, what happened, what they were doing, how they were identified. It shows the effects on ordinary objects, such as glass bottles fused together by the intense heat, or roof tiles that had bubbled and melted. It also shows the after effects of radiation, what happened to those who survived the blast but later succumbed to radiation poisoning or cancer. They said for days after the bomb, it rained black rain on Hiroshima, highly dangerous and radioactive. Hiroshima is a beautiful city with a horrid scar on it, and it is hard to describe really what it is like without seeing it for yourself, and without going to the museum. 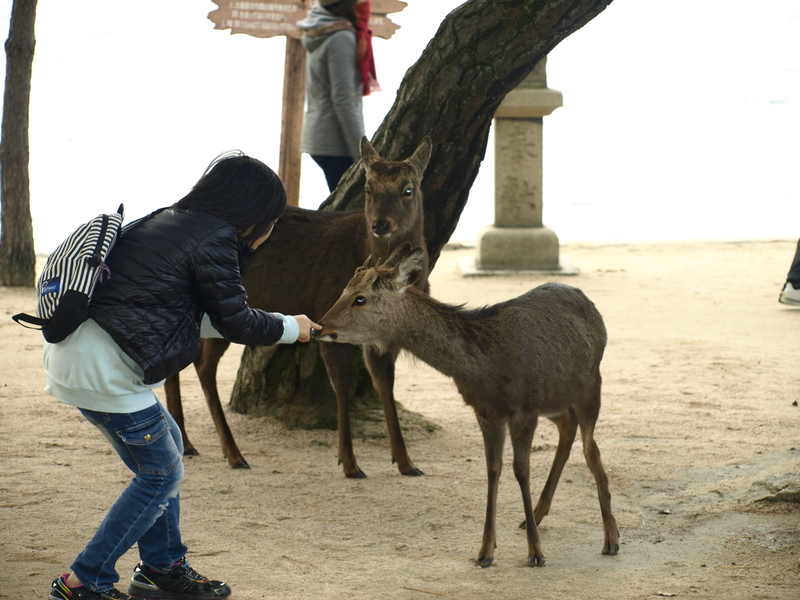 Next time, a much happier and peaceful side of Hiroshima: Miyajima Island. You can read about it here. This post has been a long long time coming, as have many others, because it takes me a long time to get around to writing about things. Considering I’m writing about Autumn when it’s nearly spring (though I still have things to write about from Summer). Anyway, back on a sunny Thursday afternoon in late November (21/11), Bettina and I (again) took a train to Kyoto. We were headed for the Eikando temple in east Kyoto. We were very lucky, despite being quite a cold day, it was incredibly sunny. However, seeing as it was late in the year, it would get dark very quickly. By the time we arrived at the temple, the sun was already going down. The temple’s full name is Shujuraigousan Muryojuin Zenrin-ji. 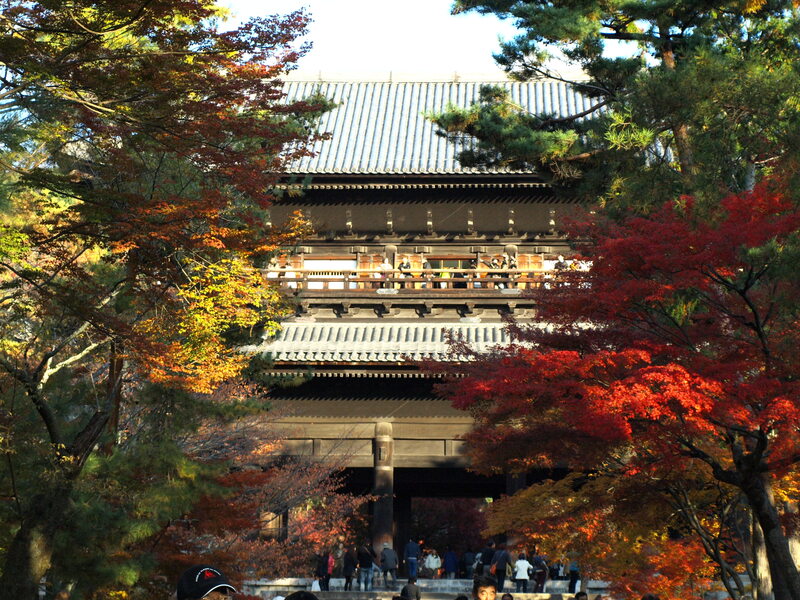 It was founded in 863AD, and is the head temple of the Jodo-shu Seizan Zenrin-ji sect of Buddhism. Of course of the centuries that buildings have been rebuilt, but it is still a very pretty place. After getting off the train at Keage, there was a bit of a walk. But this was actually very nice, down old streets and many other temples, and some expensive looking traditional inns as well. 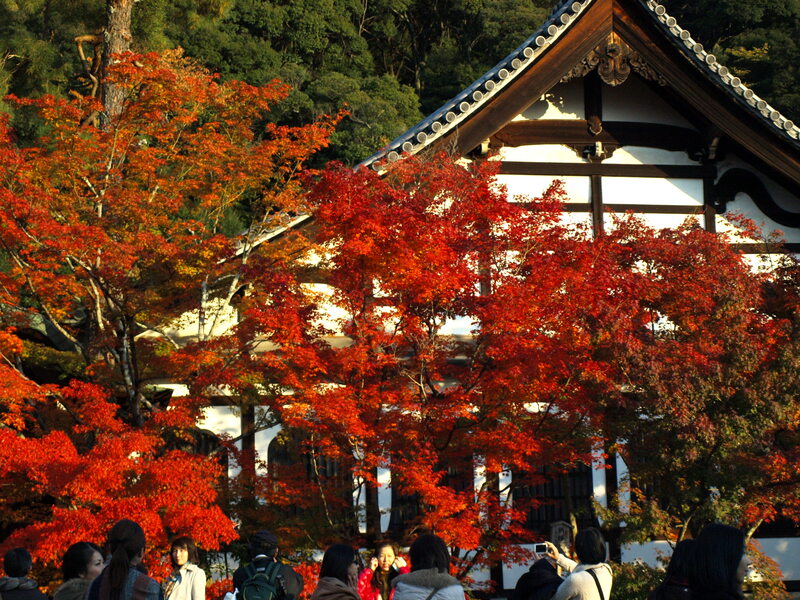 Seeing the Autumn leaves is an annual event in Japan, so hundreds of tourists milled around the area, some with bulky cameras and big back packs, others dressed in traditional kimono. We could see the mountains from the road, a mixture of greens, yellows oranges and reds. Of course, most temperate countries in the world have the same annual changing of the colour of leaves, and nobody really takes any notice of it. In Japan, it becomes part of the weather on TV, showing where the leaves had changed so far, predicting when it will be where. Being a little while back now, my memory isn’t so clear, but as far as I can remember, it cost ￥1000 to get in, which is a little more pricey than some of the other temples in Kyoto. However, I was happy to go there, as it is one of the few large temples in Kyoto I hadn’t been to yet. Though it was busy within the temple, it was still incredibly pretty, with a tall pagoda half way up a mountain, with a gorgeous view of Kyoto, and a large koi pond, surrounded by red leafed trees. See below for the photos, or here for all the photos from November.